In typical East Coast fashion we had a taste of spring at the beginning of the week; and in typical East Coast fashion, Wednesday was a massive snow storm. Ranger doesn’t mind what the weather is like (until it’s above +24) so we’ve had some great time out enjoying all types of weather. Sometimes when you don’t have a toy, your glove will have to do. Wednesday was the now scheduled dumping of snow. Apparently it was horrific out there and there had been calls for 40+cm but from my vantage point (I think I got as close to the outside as opening the door to let Ranger out potty) it didn’t seem as bad as previous Wednesday storms. The backyard didn’t fill up nearly as much, but that may have been due to the wind. Will and Ranger had their traditional wrestling match in the backyard after the walk had been shovelled. And of course, the wrestling matches inside. Thankfully they were able to keep each other pretty entertained while the storm went on outside. Yesterday we headed out to the school yard. Ranger has so much fun in the snow that this is the first year I think I have actually not minded it as much. Despite the freeze your face off windchill it was sunny and Ranger blew off all the pent up energy from the day before. We were out for about 40 minutes and it seems that Ranger has finally had a breakthrough regarding fetch. He actually went out and returned the Kong Wubba over a dozen times before I called it quits (not that I wanted to, but the last thing I need is ending on a bad note by over doing it). Ranger was fine plowing through the deep snow and even today doesn’t seem stiff or sore. I however had a little incident with Ranger slamming into my hand and have a nice little bruise to show for it. It didn’t get any darker yet so not that impressive. This morning our walk took much longer than normal since the trail had yet to be broken. Trying to break trail with a dog on a longline who prefers to walk DIRECTLY in front of you in case the deer make an appearance makes everything take a lot longer and I needed to stop for frequent breaks. Heard from the rescue today that we might be getting a new foster in soon. Excitement. Class only had two dogs in it today including us. While I enjoy being able to work on Ranger’s distraction training with more dogs, it is always nice for some more one-on-one training sessions like this one. Friday and his young trainer were the other pair. Ranger still has a hard time looking forward over the cavaletti and away from me, but we worked on me staying behind him or ahead while the instructor held his lead. Seems when he isn’t beside me he has an easier time not trying to obedience heel (even though we’ve never even practiced an obedience heel lol). Also worked on nose targeting to our dish at the bottom of a baby ramp. Exuberant Ranger exploded onto it the first couple times sliding off the side (and this is from a walk) but by the end was figuring out to use some restraint. He worked best when the drop was at the end and he plopped his front end down to nose the dish while keeping his hind end on the high part. Since I have a couple 2×12 boards at home, I might work on it using the stairs into the backyard…once the weather isn’t -17. We did some one-jump work too this week. Involved me kneeling by the standard with the pole secured (as Ranger like to drag through his hind legs) and three treats in each hand. Basically dog on one side, show treat about 12″ away on the other side, and as his front legs come over you move the treat directly beside the standard and down low. Once his hind legs are over you reward and then ask for them to go back over the same way. We did three treats in each hand (so six times over) and then took a break before doing it again. Ranger is much better counter-clockwise so we might rig something up to work on this at home too. Worked on our stays in front of a line of jumps and then releasing them. I’m now releasing him with my back to him (watching over my shoulder sneakily) and feeding by my ankle. We’re trying to stop him from watching my face so much and not paying attention to where the ground and equipment is. It seems to be helping as we finally put the jumps up (about to his ankle joint) and he waited, released, and jump the three in proper form. We also introduced the crawl tunnel (made with hoola hoop halves with each end stuck into a pool noodle. Ranger didn’t even seem to notice he was going through a weird colourful barred tunnel and stayed in it when I needed to reload treats to continue. Both ways were fine. Stayed after to speak with the instructor and I’m putting in Ranger’s name to meet with a chiro. The vet is apparently great and does most of the agility dogs at this centre. We’re not seeing any lameness, but Ranger is a very loose/clumsy dog and with his habit of curling his front paw under in the down we wonder if he might have a little pinch/annoyance in his lower back/hips that might cause problems down the way. (called into my regular vet and they will be sending over the referral and there is a two month wait). Also going to start looking to add supplements to his diet for bone, muscle, tendon health…and pet insurance in case something does happen. Figure if we’re going to make a real run at agility then we better put forth a good effort on all fronts. Until next week we’ll be trying to work on him on the right side (I did notice a difference this week from walking him on the right more) and some more targeting exercises. He will now consistently “chase” my hand to reach it. Spent the rest of the day going for a big walk through the waterfront with friends, and then out for another play date with Gauge. By the time they were done both dogs looked like they had gone swimming because of all the collected water. That’s the first picture I ever saw of Ranger. The listing on Petfinder said that “Rocky” had been there since October, was an adolescent border collie mix who got along well with other dogs and respected cats. We’d just moved into a new place which allowed dogs and I had a check list of what would best fit into our lifestyle: male (personal preference), over 50lbs, short hair, 1-3 years old, respectful of cats, good with other dogs, and athletic/intelligent enough to hopefully do some sort of classes or sport. A year ago yesterday me and a friend packed up the car and drove six hours each way to get Ranger from the Charlotte County SPCA. Will was sailing, but knew that when he got home our new dog would be there. So much has happened in the year. Will sailed a lot that summer and I was laid off work due to an injury. Ranger and I spent a lot of time together slowly walking around local parks and cuddling on the couch. He made do with some days that weren’t as exciting as others, and I dragged myself out of bed some days just for him. There were some big accomplishments through obedience and agility classes. I’ve taught him tricks I didn’t think I could using patience, praise, a clicker, and treats. He learned to trust my judgement in situations, and I learned to loosen up and let him show me he could be trusted to behave. There are many other things too. I remember looking at Ranger and seeing a happy dog that had come out of his shell and was learning that this was home. His ability to be so happy and clumsy and serious all at the same time. The way he lets me cuddling him in a different way than anyone else. That I’m his mum and he trusts me. We spent the day doing things entirely for Ranger. We took a long walk by the waterfront at lunch in Dartmouth where he hadn’t been before. Afterwards he had a raw turkey neck for his main meal and relaxed until we headed out for a play date with Gauge. 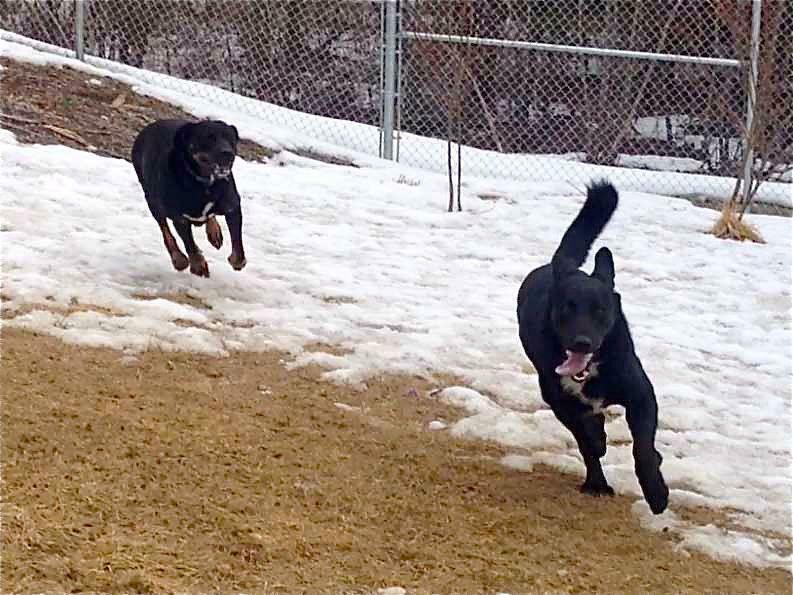 I can never get over how fluid he looks when he’s running full out, and not the clumsy pup with too big feet and flapping ears. Ranger tolerates my mistakes and has made me a better trainer by challenging me to keep him engaged and happy without being too excitable. I’m excited what this next year holds for us! Today was Ranger’s favourite day of the month: BarkBox delivery day! I’m a horrible person and didn’t review February’s box, but Ranger wanted into it fast and the foster dog was here and it slipped to the side. Suffice to say, Ranger loved everything in it! You can sign up by the month, 3 month, or 6 month package. Obviously the more you get, the cheaper each month. I did the six month package and remember that they renew automatically. Plus, each month there are different codes you can put in to get a cheaper deal. This toy is great for Ranger because he is gentle with stuffed toys (despite his ability to chew through bones with his power jaws). It comes with squeakers and crinkle paper. There are pockets to put treats in to add more fun! This ball has many positives: the ball floats in water, can bounce in all sorts of directions, and is listed as good for chewers. Jive Balls are made from recycled materials. It fits in a standard ball thrower and once it has lived its life, it is recyclable. Ranger has already been chasing it around the living room while we wait for the rain to stop. When I opened the box, you could smell the freshness of this product. The ingredients are organic, wheat-free, and lactose-free. They are made with apples, bananas, and cinnamon. Apparently the staff at Wagatha’s eat them with coffee, and I can see why. These were hands down Ranger’s favourite part of this month’s Barkbox. They are single ingredient treats made with 100% pressed lung. They were easy to snap, and even Slim the cat joined in to have one tonight. I’m becoming more and more of a fan for dehydrated real animal meat treats. They are easy to transport, have a good smell to them, and Ranger will be ANY trick to get one. With no artificial colours, fillers, or preservatives, these chews are a mixture of rawhide and USA meat. They are listed as no odour and non-staining, but we will see when Ranger gets to have it. He hasn’t been a huge fan of rabbit meat, but maybe this will tempt him. So that was this month; approximately $44.00 worth of dog stuff crammed in the little box. Definitely worth the money, and I may have added a couple items to Ranger’s Christmas list. Over the last couple days Ranger has been enjoying only dog status. We’ve walked each morning on the trail; however he’s sticking a little closer than normal on account of the deer. You’d swear he thinks he’s 15lbs sometimes. We always stop at the far end to give him a chance to sniff around (and cover himself in dead grass from last year). We’ve done training session each day working on our known commands. He loves working and gets so excited when the treat pouch comes out. Will even told me today that he had Ranger weaving through his legs for a treat the other night which makes me smile. It’s nice seeing his tricks transfer to other people. It still seems to be hit or miss with his front leg placement in the down. If he lays down incorrectly a couple time he gets frustrated at not being right so we move onto something else, return, and jackpot if he gets it right. Hoping it sticks a bit more for this weekend’s class. We started working on the first step towards him learning LIMP. He will offer his front leg while in the standing heel position, but sometimes tries offering the closer leg. Something more to work on. The evenings are spent relaxing on the couch and watching TV. Usually with one or two cats cuddled in too. Today was awful rain, but hoping for a better day tomorrow. As I promised him, today was about Ranger. Woke up early to let him out and have breakfast before snuggling back under the covers from cuddles. When we finally decided to venture out, we took the trial behind the house. Even though Ranger was on his long line, he stuck closure than normal which I think was due to the previous deer sightings. Later on we started working on Crate Games. Ranger has a good CRATE command, but I want him to be more comfortable in it and Susan Garrett really shows how fun you can make it and the drive it can build. I used cheese and slowly built up to him leaving the crate and going back in. He seemed stressed though, and I think before moving on we will work on good association with the crate before trying again. He won’t be crated here again, but if I am going to trial him with agility or take part in other sports, I’d like him comfortable in the crate. Afterwards Ranger got a huge reward, RMB time! Even though it was cold out, the sun was warm. Ranger was extremely happy to settle down and spend an hour outside chewing down his bone. Sometimes I’m not sure how his teeth handle it, but he enjoys them so much that until that time comes he can enjoy. After dinner we took a walk down to the school to use their tennis courts. I walked him on the right on the way down and he tried ducking behind to cross over quite a few times. It seems if he gets behind in the heel at all he gets confused and tried to get where he feels more comfortable. When we got to the tennis courts we did some stays/waits, and recalls. For the most part he was good, but he was definitely distracted and broke. When he did, I put him back into position and this time made a shorter distance so he could succeed. Then he played. Ranger also got all his meals from his food dispenser and it seems that even without dog-dog tiring, we’ve managed to tire him out mentally and physically. With Sophie the foster dog away on a week trial (and hopefully there to stay) I finally have time again to work with Ranger. Took him out to Gauge’s house to have some off leash steam release and apparently it was due. He tends to look loose and clumsy at slower speeds, but when he run flat out he is so seamless. Every part of him moves in perfect motion and he looks like a completely different dog. Until he gets close enough and you can see his runner’s high glazed eyes and flapping tongue. Tonight we did a run through of what we already know. He had forgotten OTHER PAW when we tried last month so I want to try at least running through them all every week or two. He remembered everything we went through and he’s now happy with four leg weaves with me stationary. Hard to work on them with movement in the living room, but will try when I’m at agility next weekend. Upping the requirements on passing me things now. Ranger now needs to put it into my hand. No more trying to catch before it hits the ground. A couple times he dropped the Kickaroo (Shady was NOT impressed we were using HER cat toy) at my feet and looked at me expectantly for his reward. I didn’t make eye contact and he quickly picked it up and shoved it into my hand forcefully. We’ll keep going with this for a bit before upping it again to holding it in my hand until I ask him to release. BETWEEN is working better and he will now take position from a WAIT. A couple times he tried ducking in when I wasn’t expecting it. I barely kept my footing. Also worked on proper front leg DOWNs. He still doesn’t quite get it I don’t think as he’ll do a bunch correctly and then a bunch incorrectly. Still rewarding for only proper downs and putting his leg how it should be on ones that aren’t.